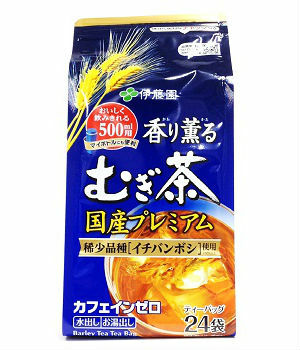 Mugicha is toasted barley tea, and is a very popular summer drink in Japan. Healthy and caffeine-free. One tea bag makes one liter of tea. Just add the cold water and chill in the fridge for a refreshing and healthy drink. Japanese barley tea made easy! Fine quality Japanese mugicha tea bags from Itoen. Just add cold water. Mugicha is toasted barley tea, and is a very popular summer drink in Japan. One tea bag makes one liter of tea. Just add the cold water and chill in the fridge for a refreshing and healthy drink. Mugicha is widely believe to cleanse the body and reduce stress. It is caffeine free so ideal for all the family, even babies. Made by Itoen, the world's leading purveyor of green teas and beverages.